Cricket Victoria is pleased to welcome Peak Nutritionals as the Official Protein and Nutrition Powder for the organisation. With an increasing focus on mind and body preparation in Victoria’s elite cricketers, the new partnership came about through Cricket Victoria’s High Performance team. Peak Nutritionals is focussed on encouraging Australians to be active and healthy in the way we live and engaging women in sport and physical activity. Andrew Paterson from Peak Nutritionals said the company was excited to play an important role in health and wellbeing of players. 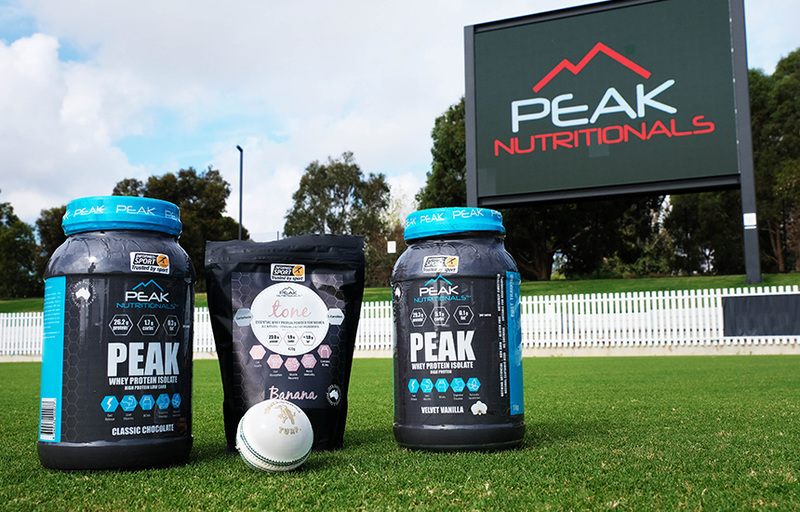 “As a 100% Australian owned company, Peak Nutritionals are excited to be partnering with Cricket Victoria to support player development through the use of high quality sports nutrition products for the players. We are passionate about sport participation and performance and dedicated to supporting our local sporting communities. We look forward to forming a long-term partnership with Cricket Victoria,” Paterson said. Peak Nutritionals have male “Peak” and female “Tone” focussed products to provide tailored products for both audiences. Cricket Victoria’s Commercial Sales Manager Leigh Dooley welcomed the Peak Nutritionals partnership. “We are committed to providing the best preparation environment for our athletes and Peak Nutritionals will become an important part of that program. We look forward to working with Peak Nutritionals and our players to enhance all aspects of their preparation,” Dooley said. We at Peak Nutritionals are passionate about Sports Nutrition and encouraging Australian’s to be active and healthy. We are 100% Australian with the simple vision of providing everyday champions a premium quality, all-natural product to support their health regime. That’s why we created a range of premium sports nutrition products under the Peak and Tone brands, catering to both Men and Women and their differing nutrition needs. Partnering with Cricket Victoria is a highlight for us as we both share the same goal of encouraging all to actively participate in sport in Australia. Particularly women in sport which is close to our hearts and the basis behind our Because We Care campaign behind our women’s sports nutrition product Tone. Click here to learn more about Peak Nutritionals.